Delphi, with its remarkably preserved ruins dotted along the southern slopes of Mount Parnassus, is one of Greece’s most famous archaeological site. Dating back to the seventh century BC, the ancient city of Delphi is protected as a UNESCO World Heritage Site and home to sites such as the Sacred Way, Stoa of the Athenians, polygonal wall, monument of Platea, and Temple of Apollo. The only way to explore the sprawling ruins of Delphi is on foot. 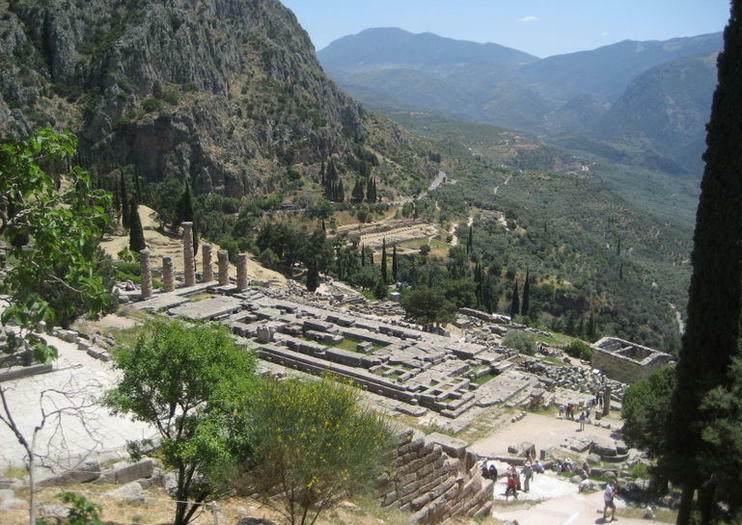 Visiting with a tour guide offers a greater insight into the fascinating history of the archaeological site, while the nearby Delphi Archaeological Museum offers an array of exhibits.. Most visitors choose to visit on a day tour from Athens or Patras, often combined with nearby attractions such as Arachova, Saint Lucas Monastery, or Meteora. The ruins of Delphi are spread over a large area—plan at least half a day to take in the highlights. Bring sunscreen, plenty of water, and comfortable shoes to walk around the ruins. The Delphi Museum is wheelchair accessible, but due to steep and uneven ground, it is not possible to visit the ruins up close via wheelchair. Delphi is located at the foot of Mount Parnassus in central Greece, 112 miles (180 kilometers) northwest of Athens. The closest airport is in Athens, about a 3-hour journey away, and it can be reached by bus or car. The busiest time to visit Delphi is summer, so arrive early if you want to skip the queues and avoid the midday heat. For cooler weather and fewer crowds, visiting in spring is a popular alternative, while winter visitors can make the most of the nearby ski resorts. In ancient Greece, Delphi was considered the center of the world, or the place where heaven and earth met. Legend says that Zeus released two eagles from opposite ends of the earth to find its center, and they met over Delphi. The city become a sanctuary to the god Apollo and home of the famous Oracle of Delphi, a trusted oracle from which the spirit of Apollo gave advice on everything from domestic matters to war.